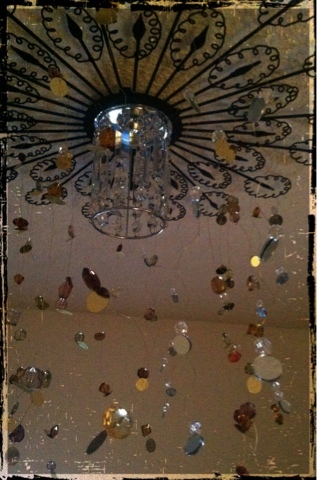 A few months ago I made this chandelier for my room. I used a sunburst that I bought from Ross and mounted a crystal tea light holder to the center. I then added some circled mirrors and crystal gems onto some wire to fall. I’m changing the color theme of my room from black and silver to champagne and brown, so in order to keep with the color theme, I added some brown jewels and gold tinted mirrors to my chandelier. I’m loving it right now.